Interns are ones who are lured by your business and wish to learn your business. These interns are ones who help your business and enhance productivity. Usually, there would be high-quality interns who work free for any business but that status is very rare today. Interns are important for an organization as they bring in fresh and innovative ideas; elevate productivity, and spread about your business to other people around. They work as interns and turn into full-time employees in an organization. The organization should dedicate time for training the employees. An internship payment is still considered as grey area, so let’s glimpse on should interns be paid and the amount to be paid, also the average pay for interns is to be analyzed. According to the national association of college and employers (NACE), an insight to the interns pay for their work is depicted. While students get closer to their terminal degree, an enhanced internship wage is obtained. An example is that college senior gains more amount than a freshman which would be $17.57 versus $13.91 per hour. In the same manner, a higher degree would gain a higher wage. The latest intern compensation report from NACE states that a master’s degree hourly wage is 35 percent more than that of a bachelor’s degree wage which is stated as $21.93 compared to $16.21. Interns gain the benefit of obtaining best educational experience, industry experience and access to higher level employees. Hence payment is very important for interns which allow attracting more employees. At times of summer internships, interns work for full time and earn a considerable amount of money. In the same manner when its school time the working hours for interns should never be greater than 15-20 hours a week. The time commitment is something important which makes the internship amount. The law relating to interns mentions that unpaid interns are averted from replacing current employees and aren’t allowed to do non-educational work and ad hoc. Unpaid interns are ones who usually experience much enhanced standards in terms of experience and educational benefits. The six factors developed by the department of labor’s wage and hours division helps decide if the individuals are interns which are determined under Fair labor standard act. The interns through work in the actual operation of employees is considered as educational environment, the main intention of an internship is for the benefit of the trainee and hence payment is thought of. The interns are ones who work under close observation and do not replace regular employees. The employer though his operations are impeded offers training to the interns. Once the internship is completed the employee is not offered a job quickly. 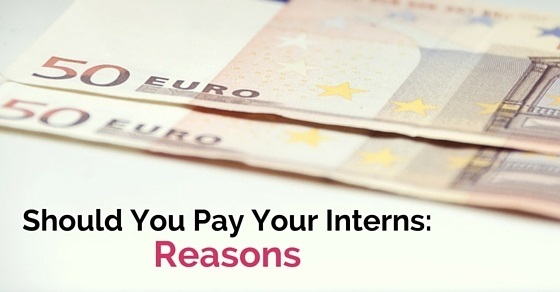 These entire reasons make up that an intern is to be unpaid for internship programs. Interns catch hold of best internships for plenty reasons such as building their resume, developing their skills and to get into as a full-time employee. Employers take advantage of this chance and do not pay the interns. But there are few good companies such as Google, Facebook, Amazon, black rock, and more which pays the interns about $5,100 and more. In the same way, the oil and gas company giants pay $6,506 as salary for interns. This was the details listed by Glassdoor. The intern bridge 2010 internship salary report mentions that about 68% of 25000 employees are said to receive a wage of $12.54 per hour. The NACE 2014 internship report and co-op survey state that many employers decide to hire interns and pay only 98 percent of them. There is an argument that many interns are not paid well and survey reports show that average hourly wages for interns for bachelor’s degree is $16.35 and for master’s degree it’s $22.50. There are abundant candidates who are willing to work free, is there a necessity to pay the interns? There have been a number of surveys and a report which has opened up that paying a wage for interns brings in a lot of benefits. The main aspect is that when wages are paid, the number of applicants applying for an internship enhances. When interns are paid they are more likely to turn out as an employee and also stay for a long time with the organization. The risks with paid interns are always lower. There are lots of risks associated with internship lawsuits such as Fox Searchlight and Conde Nast. Unpaid interns can indulge in bad publicity and hence leave you under the risk of being sued. Companies expect the right fit and quality candidates when they change from unpaid to paid interns. When paid interns are selected there is an elevated quality of the candidate, the speed in training is also made quick and more. When payments are made, quality and top applicants are obtained for an internship. When internships are not paid their training would be something similar to school training. There is a little direct benefit for the interns from the organization. When an intern is not paid, then he may not replace the work of an employee in the organization. The employer would also not be able to derive any advantage from the intern. The next aspect is that the intern would not be entitled to employment. In the same manner, the intern must also be aware and know that they will not receive any wages for the internship training. During a paid internship, the applicant is autonomous and not automatic, they are filled with enthusiasm to work and contribute to the organization. They are ready to work and contribute to their team and willing to work hard. At any situations, paid interns are able to go above and beyond levels. They can be perfect candidates for future hire in the organization. When unpaid interns are considered they resist and stay for only three months. They require more of motivation and lack accuracy in their work. They do not make a complete contribution to the organization and hence paying interns is the right choice as confidence is developed. The average pay for interns varies according to the degree and hours they work. In that aspect, a bachelor degree freshman can earn an average internship salary or hourly rate of $15.05 with an average co-op hourly wage rate of $15.17. A bachelor degree junior can earn an average intern hourly wage rate of $17.19 and $17.93 as average co-op hourly wage rate. In the same manner, a bachelor degree senior earns $17.94 as average hourly wage rate and $19.24 as average co-op hourly wage rate. A master degree first year student would earn about $22.21 as average hourly wage rate and $23.46 as average co-op hourly wage rate. The last but highest wage rate is for master degree second year internship students who can earn an average intern hourly wage rate of $23.06 and $26.82 as average co-op hourly wage rate. Apart from payments, many employers offer their interns with compensation packages. Some of them are relocation assistance, a housing stipend and more as compensations. Other employers who offer compensations are social activities for interns along with holiday pay. Apart from employers who make an average internship pay, there are tech firms and oil companies which pay the best for interns. With a survey which was made to find internships and top paying interns, there were few financial companies too which made a list. To attract the top talent of next generation paying a higher pay for interns is essential. Hence the hourly wage rate for interns differs depending upon the company they work and also the degree they pursue. Unpaid interns are illegal these days as per the United States Department of Labor. Another benefit of paying an employee is that when interns are paid, a number of candidates obtain for an internship. They also can gain experience and find chances to get into as full-time employee which was found by a research by the National Association of Colleges and Employers. They found and stated that 63.1% of interns obtained a job offer once they graduated. By all this survey and explanation it is concluded that paying interns is always the right choice which has been highlighted in varied scenarios. The data mentioned above is an example for interns to know that payments are received and important for an internship. Run through the sites and get a list of companies that pay their interns and look for such companies. For students who desire to get into an internship, apart from gaining industry expertise and knowledge, obtaining payments are also important.